There are timepieces that you take on adventures, and then there are timepieces that make whatever you’re doing feel like an adventure. Marathon Watches are the latter in that statement. When I first started getting into watches I was presented with an opportunity to pickup a Marathon TSAR, which is essentially the quartz version of the Marathon GSAR, which is the watch I’ll be reviewing today. I mention the TSAR because that watch left an impression on me, to the point where 3 or so years later I picked up the GSAR. 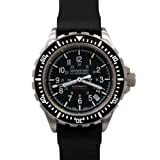 Marathon watches are made primarily for military contract, they began making watches for allied forces in 1941 and have maintained a reputation for that ever since. The Marathon GSAR comes with a 42mm case, but it’s on the taller side. On my 7.25” wrist it wears like an Seiko SKX with a little more girth. The bezel overhangs the case a little bit so in terms of actual case size fit, it wears smaller than it looks. I’ve found that on both the rubber strap and the bracelet it’s very comfortable and relatively unobtrusive in your day-to-day, with the exception of the crown. The crown itself is oversized for quick adjustments but it can also dig into your hand at times. Marathon chose the ETA 2824-A2, a robust and well known Swiss-Made movement with a 42hr power reserve. ETA movements are a well known variable in the watch world, the A2 iteration is slightly thinner and has a longer power reserve than the regular ETA 2824-2. The data on the performance of this movement by Marathon is a bit mixed, but my experience has been really good. Spot on time keeping observationally, with my WatchTuner app showing +/- 1-2s/day. I’ll take that. The case on the GSAR is utilitarian, brushed steel facets with an oversized bezel and crown. The bezel overhangs the case by a good millimeter on each side. That is largely what contributes to the watches wearing smaller than it is. The crown is a 5.5mm knurled crown, the knurling is a very cool touch. The crown is also gently cradled by two very angular crown guards that do a decent job of protecting the it from any serious knocks. The lugs are simple, but they have the greatest feature of them all… They’re drilled. Some dudes get a lot of heart burn about the holes in the case, but man does it keep you from scratching your lugs with a springbar tool. Let’s work top down on this one, starting with the bezel. The Marathon Bezel (regardless of SAR model) is a 5.17mm thick with a black aluminum insert in it. The bezel is a traditional diving bezel with minute markers all the way around. There is a traditionally lumped pip at the 0 mark, my example lines up perfectly with 120 clicks around the circumference of the dial. The crystal is a highly functional albeit unremarkable flat, AR coated sapphire crystal. This is a watch you would NOT want a dome on, it’s already a tall (approx 1.5 Oreos thick) case and a domed crystal would just attract knocks. The AR on it is done very well, making it look as if you can reach in and touch the hands if you want to. The dial, is complex, but highly functional as you’d expect from a watch meant for military service. First things first, the dial has green tritium tubes on all the hands as well as for the hour indicators. The noon marker is in amber tritium. Tritium tubes are small glass tubes filled with tritium gas that give off a benign radiation and thus glow. I’ve owned a few other watches with tritium dials, in particular Deep Blue watches. Deep Blue uses T100 tritium tubes, whereas Marathon uses T25 tubes. The basic purpose behind this is making sure that the dial is always visible, but not so bright that it may give away a position or provide a distraction. The T25 tubes are visible at night, but not overpoweringly so. The T100 tubes, you could read by. Moving past the lume, we have a black painted dial, with arabic numbers all the way around. Inside the large 12-hr numerals there are the related 24-hr PM numerals. This makes the watch easy to read in either 12 or 24hr time as long as you can keep track of AM/PM. Between the 4 and 5 o’clock hour is a date window, the date is on a white date wheel that pops against the black dial. Lastly the hands are “syringe-style,” that lend themselves to precision both when reading and setting it. All in all the dial is function forward that once you get the gist of reading it, it has the ability to communicate a large amount of information at once, and be visible at realistically any time of the day. My GSAR came with both the steel bracelet and the vulcanized rubber strap. I’m going to address each separately, but the TLDR version is that both are excellent depending on what context you want to wear them in. The steel bracelet that Marathon makes and offers with the SAR series of watches is a great example of why bracelets don’t need to be ridiculously expensive to be quality. The links are screw together construction, it takes two small screwdrivers to size it, but it’s a better system than split pin or pin and collar. I’ve found in day-to-day use that the bracelet in comfortable and dresses up what would otherwise be a pretty rugged looking watch. The end links are separate pieces that are attached by the spring-bar, but everything is solid metal. The best part about the Marathon rubber strap is that it smells like vanilla, and not a passing slight scent, but a vanilla frosting on a cupcake smell. When I’m driving with my Marathon on I can smell the strap if the AC is blowing across the watch, it’s crazy. Apart from that the rubber strap is very high quality, it’s roughly 4.5mm thick, and tapers from 20mm to 18 at the buckle. The edges are beveled, and the buckle is signed. A very cool and rugged way to wear this particular piece. If what you want is a no-nonsense mechanical time piece that uses a proven Swiss movement, tritium, and an overall toolistic approach. The GSAR (or really any Marathon watch) is perfect for you. There is a lot to like about the GSAR, and very little to fault about it. It is a bigger watch, but the way that Marathon kept the case trim and allowed the bezel to absorb that size keeps it wearing nicely. The time keeping on mine is excellent, and the tritium lume is a really cool feature. I really cant recommend the Marathon GSAR enough. I recommend purchasing the Marathon GSAR at Amazon. Please consider that purchasing anything through any of the links on this website helps support BladeReviews.com, and keeps the site going. As always, any and all support is greatly appreciated. Thank you very much. One day, I was in Mexico hunting with friends. They were shooting beautiful engraved silver over and under shotguns. Mine was a discontinued Japanese semi auto that cost me $170 plus tax. The guys were laughing at me. I asked the guide to tell them why I was carrying a plain ugly shotgun. “When the federales take it from him, he won’t miss it”. I have a cheap $20 (goodwill) Timex that I wear when I go out of town, in field, or on a plane. It took 3 months to recover my laptop that TSA “lost” at the scanner one time. I would cry if I lost such a beautiful watch. Great review. The GSAR is probably the most popular Marathon military watch. It was introduced in 2006 and replaced the famous SAR. We have been supplying Marathon watches since 1996. For a seemingly indestructible watch with many great reviews, it is surprising that it has two major fatal flaws: the crown threads stripping, and the insufficient winding gear lubrication. The latter will cause the gears to bind and eventually strip so that the winding mechanism will no longer work if not caught at an early enough stage. The crown thread issue is more of a pain – you cannot get this serviced at a regular ETA-authorized service center as this piece is unique to only marathon. If you can live with the above then this will be a fantastic watch. If not, you may find better elsewhere.